1 of 5 Combine flour, cocoa powder and salt in a small bowl. 2 of 5 Beat butter and brown sugar in large bowl until fluffy, 1 to 2 minutes. Add egg and vanilla; beat well. On low speed, add flour mixture in thirds and beat until smooth. Shape dough into disk; wrap and refrigerate 1 hour or overnight. 4 of 5 Divide dough into 24 equal portions. Lightly cover flat surface with sifted cocoa powder. Roll each portion in powder into 9-inch rope. Twist into pretzel shape. Space 1 inch apart on ungreased baking sheet. Redust surface with cocoa powder as needed. 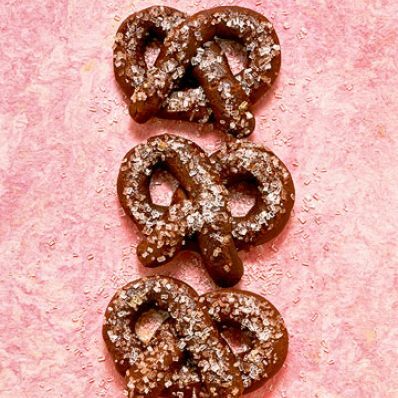 Brush pretzels with egg white. Sprinkle with sugar. 5 of 5 Bake in 350 degrees F oven 12 to 14 minutes or until just firm. Let cool slightly on sheet on wire rack. Transfer pretzels to racks. Let cool completely.